Different forms of rational and experiential knowledge underpin the way we learn about the city; the way we discern where is safe and unsafe, what is just and unjust, and what realities – as well as whose – coexist in its everyday life. As argued by Colin McFarlane in Learning the City, this knowledge of the city is not something that urbanites either possess or lack. Rather, it emerges from the process of making sense of the city, in which urban dwellers reproduce or contest data and information, as well as beliefs, discourses and practices. Furthermore, the learning process is not completely internal to individual women and men, but rather shaped and reshaped by multiple interactions with other people, places, stories, images and imaginations. This is the first of two interlinked articles that reflect on the insights on public learning gained through the action-research project cLIMA sin Riesgo. Focusing on Lima, the world’s second largest desert metropolis, the project explores the conditions that produce and reproduce vicious risk accumulation cycles, or ‘urban risk traps.’ It looks at how and where risk traps materialise, and with what consequences for women and men living in two contrasting areas: Barrios Altos, located in the historic city of Lima, and José Carlos Mariátegui, situated in the poorest and most densely populated district in the periphery of the city (Allen et al, 2015). In these areas, most local dwellers live in conditions of poverty, marginalisation and high vulnerability to everyday risks and small-scale episodic disasters. In 2015, both areas were among those declared under emergency due to the forecasted impacts of the warm phase of El Niño Southern Oscillation (ENSO). The ENSO cycle – both El Niño and La Niña – causes global changes in temperatures and rainfall, which for local residents means worsening everyday risks and episodic disasters threatening human life and wellbeing, as well as man-made and ecological infrastructure. The project approaches ‘public learning’ as a means to reframe the way in which everyday risk is perceived, experienced and addressed, in order to promote concerted and strategic interventions to build just urban resilience. This piece reflects on how such learning can be deepened when those directly exposed to everyday risks participate in mapping and surveying their own neighbourhoods (Lambert and Poblet, 2016). Learning about urban risk is a complex process, requiring individuals to anticipate potential dangers before they occur. Furthermore, while many urbanites might be aware of the potential threats of large-scale events such as earthquakes, the risks underpinning the everyday lives of marginalised people often go unseen. Paradoxically, the experience of everyday risks is often invisible to those who are most exposed to them, and thus internalised as something that is part of life. 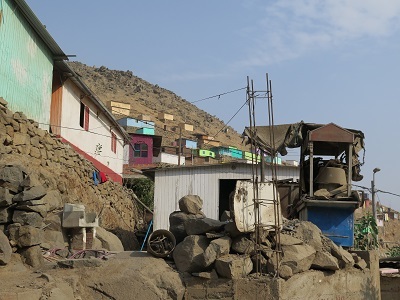 This is the case for instance, when local dwellers believe that living without water and sanitation or negotiating their everyday life through the steep slopes is part of the price they have to pay to remain in the city. cLIMA sin Riesgo starts from the assumption that everyday risks need to be learnt spatially both by those who experience them and those who aim to address them. This requires the inclusion of the lived experiences, exposure and perceptions of those who are most vulnerable to them at the scale of the neighbourhood (‘barrio‘) and the household. 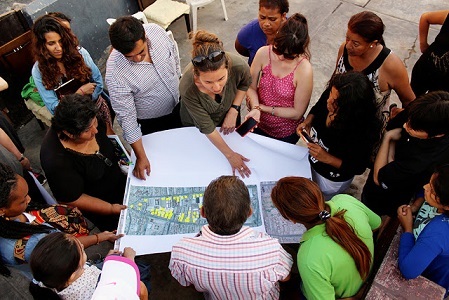 Between July and November 2015, the team conducted a comprehensive participatory survey that covered 700 households – about a third of the total households found in 12 informal settlements in José Carlos Mariátegui and in the rented multi-family housing units (‘quintas’) of Barrios Altos. Local women and men joined a research team combing the neighbourhoods through the application of a geo-referenced questionnaire. Using accessible smartphone technologies such as Epicollect+[i], they gathered data on types of risks affecting dwellers in each area, what makes some households more vulnerable than others and how people respond to these conditions to cope, mitigate or prevent actual and potential impacts. The survey offered insight into the capacities of local dwellers to act individually, collectively and with external organisations. The process allowed those taking part in the survey – both as interviewers and interviewees – to make sense of common experiences but also different realities confronting people in the same area. Furthermore, zooming into the household and out into the wider scales’ of each area and the city revealed many of the processes and actions that produce and reproduce risk traps. In Barrios Altos, for instance, we recorded the quiet process by which many of the multi-family structures that are part of the cultural heritage of the city are being turned into warehouses that store heavy containers that often provoke the collapse of buildings. We also captured the process of quiet eviction in which pipes are intentionally broken to make dwelling impossible, thus forcing tenants out of the quintas and making it possible to demolish and redevelop the area for more lucrative and speculative purposes. In José Carlos Mariátegui, zooming from the level of the household and local community (‘Agrupación Familiar’) into the wider political geography of the settlements’ slopes revealed how urban risk traps are exacerbated by the actions of land traffickers who, through the illegal appropriation and sale of land, urbanise the upper areas of the slopes, resulting in frequent rockslides and landslides that affect those living below. It is said that ‘we live and learn’, but can we reframe our learning of the experiences of others, faraway from our own everyday lives? A follow up piece (coming soon) will reflect on this question and on how public learning might reveal the unseen, helping us to learn urban risk beyond our lived experiences and to be part of transformative change. [i]Epicollect + is an open source smartphone application that enables the design of surveys and the georeferenced data gathering and its transferal onto GIS. [ii] Drones are remote controlled airborne devices with cameras capturing up-to-date images. Although there is controversy about their application, if used sensitively, they can help advance the visualisation of typically disregarded realities. 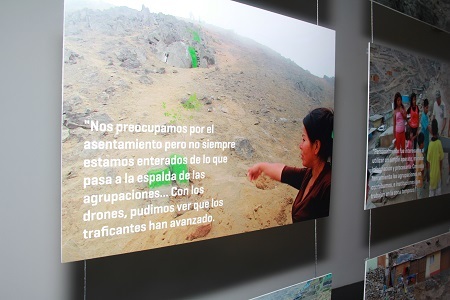 In ReMapLima, a project that preceded cLIMa sin Riesgo, drones were used to generate up-to-date images of both settlements which were later used as a cartographic base to geo-referenced the data gathered through the mapping process.